Scientists at the University of Southampton have shown how stimulating a specific location on the surface of immune cells can be targeted with antibodies to help in their fight against cancer. The new work concerns a receptor called CD40 found of the surface of certain immune cells which regulates their activity. 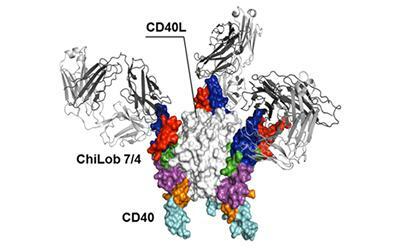 The CD40 receptors are normally dispersed over the surface of resting immune cells, but must be concentrated and clustered into highly organised complexes in order to trigger an immune response against cancer. Scientists believe that very precise clustering is required to trigger an activation signal to ‘kick-start’ the immune cells as they fight diseases, including cancer. The use of the body’s own immune system to find and kill cancer cells is rapidly changing the way the disease is managed and treated. Cancer displays unique markers that can be recognised by the immune system but cancer frequently prevents the immune system’s attack by putting the immune cells into a state of exhaustion. A new family of immune-boosting drugs, many of which have origins in Southampton laboratories, are able to reverse the cancer cells ability to exhaust the immune cells and kick starts them. Even though results in clinical trials are very promising, with many patients being cured, it does not work for all patients. However the Southampton scientists believe better understanding of how these immune-stimulating antibodies work will improve results for more patients. The pre-clinical study was carried out by scientists from the University’s Antibody and Vaccine Group based at the new Centre for Cancer Immunology, alongside researchers in Biological Sciences and the University of Hamburg. Published in Cancer Cell, the study also found that the ability of antibody drugs, which bind to the CD40 protein, to cluster the immune cell’s receptors was a key requirement for the immune cell to “wake up” and fight the cancer. Professor Martin Glennie, senior author on the paper and Head of the Antibody and Vaccine Group at the University of Southampton, said: “Understanding the complex dynamics between where and how an antibody drug engages an immune cell is key to designing more efficient treatments. “It is the combination of the location of CD40, which seems to be a real sweet spot of activity, along with the ability to cluster the immune cell’s receptors that gives such a potent response, one that we hope will be translated into the clinic to benefit patients. 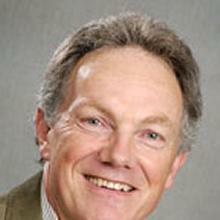 Professor Martin Glennie is Professor of Immunochemistry within Medicine at the University of Southampton.